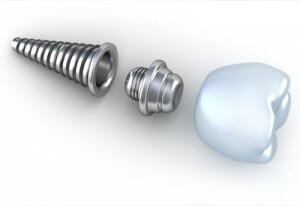 A dental implant is made of three equally important pieces: the titanium implant, the abutment, and the crown. In the first step of the procedure, the implant is surgically placed into the jaw bone. After placement, the titanium implant begins to fuse with the jaw bone. This creates a connection between jaw and implant very similar to that between jaw and a natural tooth. The next step is to fit the abutment over the part of the implant that is exposed above the gum line. Finally, the crown, the piece that looks like a natural tooth, is placed over the abutment.